Dave Winfield, another MLB Hall of Famer, was the grand marshal in the Grand Slam Parade that kicked off the Little League World Series events the evening of Aug. 13, also in downtown Williamsport. The parade, in which all 16 world series teams rode, began at 6 p.m. Winfield also spoke at the Grand Slam Kick-Off Breakfast at 8 a.m. the next day at the Genetti Hotel. 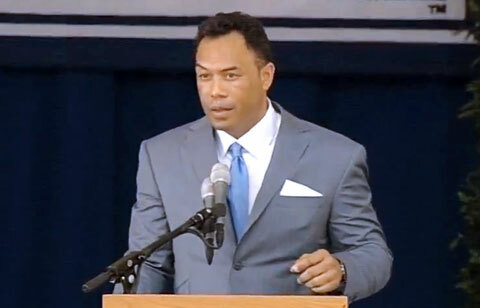 Watch Roberto Alomar speaking at his Hall of Fame Induction Ceremony. There was also an unveiling of 10 bronze statues in Market Square to recognize the heritage of Little League in the community that took place at 1 p.m. prior to the block party on Aug. 22. The statues of a first, second and third baseman, catcher, batter, three runners, umpire and manager, will be at the corners of the square adjacent to home plate and the bases. The manager will be Carl E. Stotz, who founded Little League so his nephews would have a place to play organized ball. Stotz founded what is now the largest youth sports organization in the world 75 years ago in Williamsport. Its international headquarters and baseball world series for 11- and 12-year-olds were moved across the river to South Williamsport in 1959. Playing Field Promotions is a booking agent for motivational sports speakers and celebrities. If you would like to book Roberto Alomar for a speaking engagement or appearance, contact Roberto Alomar’s booking agent for appearance & speaker fees at 1.800.966.1380.